Proudly display a classic address plaque with Mayne’s Woodhaven Address Sign Post. This New-England style Address Post fits over a 4×4-inch post to create an elegant, beautiful way to hang a traditional address plaque. The Woodhaven Address Post is constructed from 100% polyethylene which delivers an incredibly strong and remarkably lightweight post. The UV inhibitors within the resin allow for long-lasting fade-free performance year after year. 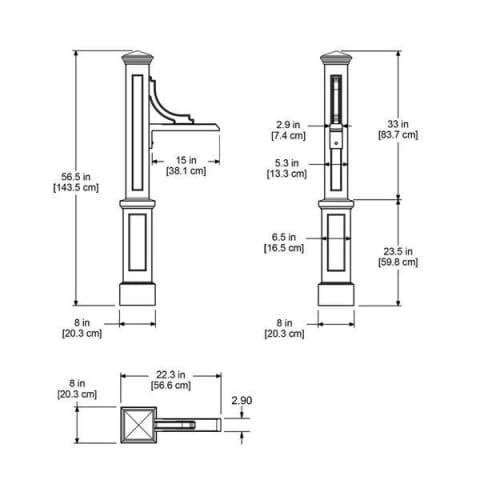 Included is a large decorative post and a support arm. Create a beautiful look with the Woodhaven Address Sign Post that will sure to be a real hit in your neighborhood. Available in white, clay and black.